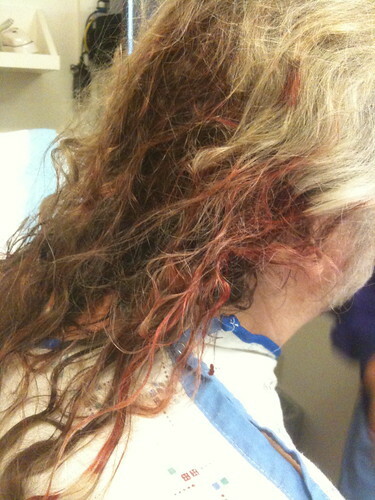 Here, courtesy of shelly_rae, are photos of the zombie hair incident. My grandmother used to wear her hair in a variant french braid, where the long braid started higher and made a crown around the top of her head. Assuming you don't just lose that pretty long hair to the chemo, if you need surgery again, maybe you should see the hairstylist first! Additing to the eww factor in that first photo you can see just one of the many blood clots that glued his hair in mats. I could go into more details but this is brekkies time. Wait how the hell did that happen?! Jay: just be thankful women don't menstruate through the crown of their heads. What's icky is more the pain it must have caused you to have this lot detangled than the blood, which doesn't actually look that bad. Yah, I didn't know about the blood til they told me - didn't lose enough to cause problems internally. Doesn't take much blood to cause problems in the hair, though. 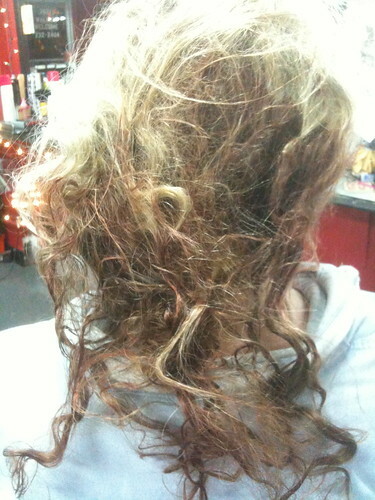 It dries quickly in clots and with certain kinds of hair, this is disastrous. I've had to cut chunks out of my hair with scissors and that's without the aid of blood. For the record, adding the blood from a modest head injury to dyed-pink hair is an excellent way to make an X-ray tech do a shocked double-take from the other end of a hallway. Oh, my. That was a mess. But you cleaned up purdy. Your hair is awesome curliness when it came out of the french braid. 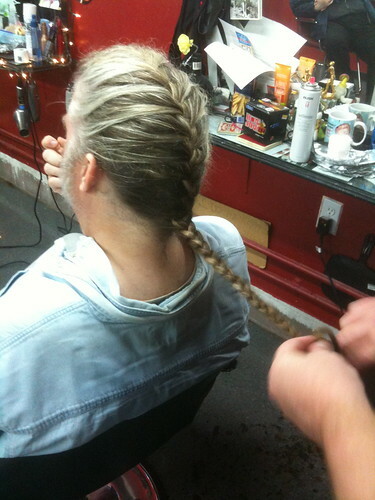 Make sure someone braids your hair when you are about to do the surgery thing from now on. It will make things easier afterward. You heal up and get better now. 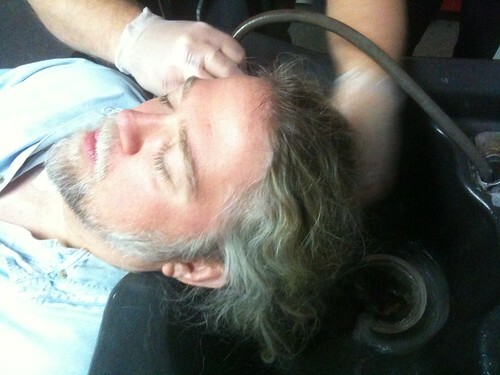 The picture of you lying back getting your hair washed is actually quite beautiful. You look so peaceful and beatific.